Legal & General - Stafford Railway Building Society. When registering with this lender, please inform them that Legal & General Mortgage Club will be one of your nominated routes for payment. You will need to tick the box for “Legal & General Mortgage Club” as your assigned mortgage club on the application form, which can be downloaded from their website. We have been offering mortgages for over 140 years lending throughout England and Wales. We operate from a single site in the centre of Stafford, which means there are no call centres. You will always be able to contact a member of our mortgage team directly and can discuss your quirky cases with an underwriter directly. We understand that not every case is conventional, and with the ever-changing way mortgage customer are choosing to work, live and expand their portfolios, we are here to help the unconventional. We also credit check not score all our mortgage applications. 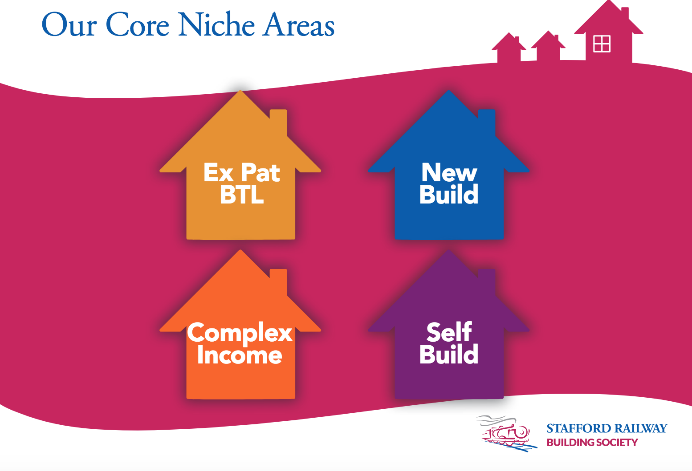 We specialise in the following areas.